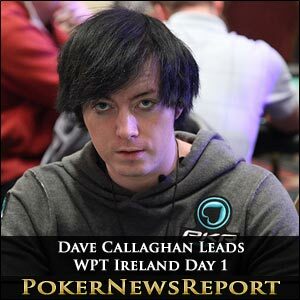 Dubliner Dave Callaghan heads the field after Day 1 of the €2,500 buy-in main event of the World Poker Tour (WPT) Ireland at his home city’s CityWest Hotel. The home favourite had amassed a 186,900 chip stack after 10 levels of play to lead second placed Johannes Meyer (179,400), of Germany, and American Jacob Nielson (161,700) in the inaugural WPT stop on the Emerald Isle. The top 10 was completed by English duo Shaun Conning (143,300) and Sam Macdonald (122,000), Irish pair Francis ‘Wally’ McCormack (118,000) and Con Collins (115,700), German Evan Christ (105,700), debonair Dubliner Andy Black (104,000) and Frenchman Julien Dolay (98,200). A total of 338 players started Day 1 of the WPT Ireland, with 195 making in into today’s second day after nine levels of play, even though the PokerStars Caribbean Adventure (PCA) kicked off on The Bahamas on the same day. Some of the biggest names in British poker were certainly attracted by the charms of Dublin, including players such as November Niner Sam Holden, John Eames, Matt Perrins and Triple Crown winner Jake Cody, from Rochdale. But it was PKR Poker sponsored expert Pot-Limit Omaha Poker player Callaghan who ended Day 1 in charge as all the entrants aim to secure the €202,680 top prize, as well as a seat at the $25,000 buy-in WPT Bellagio, after he gradually chipped up during the opening day of the main event. Callaghan, who rarely plays No-Limit Hold’em Poker, secured his largest pot after seeing off an opponent who had gone all-in for 22,000 chips on a flop of K-K-9 with the pot only sitting at 3,000. The Irishman – after grinding for most of the day – made the call while holding jacks to be confronted by a pair of eights. The turn and river cards failed to improve his opponent and Callaghan took down a pot of about 45,000. Black, meanwhile, made his move up the rankings about halfway through Day 1 with the blinds at 100 and 200 with a 25 ante. The experienced and entertaining Dublin star made it 600 chips to go pre-flop, only for Sweden’s Sofia Lövgren to then three-bet to make it 1,300. Black called, of course, to see a J♠ 7♥ 3♠ flop, before checking, which persuaded Lövgren to make a 1,600 bet. However, Black then went on the offensive with a raise to 4,500. Lövgren took her time, but made the call as the 3♦ arrived on the turn. Black popped 4,600 chips into the ever-growing pot and the Swedish star called to see the 4♥ come on the river. Now in full-on aggressive mode, Black bet 15,000 and Lövgren called, only to see Black reveal 7♣ 7♦ for a full house. Lövgren mucked her cards as Black upped his stack to over 80,000, before he later added another 24,000 to end Day 1 on 104,000 chips. Other big-name pros to make it into Day 2 with competitive stacks include Marty Smyth (65,600), Dermot Blain (76,000), Ross Boatman (79,600), Sam El Sayed (90,400) – who eliminated Ross’ brother and fellow Hendon Mob member Barny Boatman – David Nicholson (92,100) and Jon Kalmar (97,300). Other experienced players still in the field, although down on the average chip stack of 55,108, include Tatjana Pasalic (26,900), McLean Karr (42,000), James Dempsey (26,100), Kara Scott (33,000), Leo Margets (31,000), Marvin Rettenmaier (31,600), Cody (49,100) and 1996 world snooker champion Ken Doherty (53,500). Of course, some big-name pros also hit the rail early, including Padraig Parkinson, Sam Trickett, Praz Bansi, Matt Perrins, James Akenhead and John Eames. Trickett then shoved all-in not long after with A-10, only to be faced by A-Q. As with the previous losing hand, Trickett was unable to improve sufficiently and was quickly heading for the exit door. The payout structure has also been announced, with first place picking up €202,680 and a $25,000 WPT Bellagio seat, while second will leave with €111,130 and third is assured of €74,090. Thereafter, fourth will win €52,600, fifth will leave with €39,270, sixth place has €31,120, seventh will be handed €23,340, eighth possesses a payout of €17,400 and ninth gets €12,600.